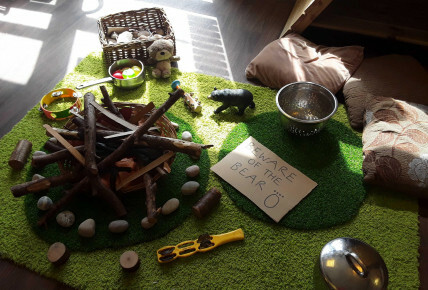 Today the children in Pre-School have been using their imagination to create a campfire. 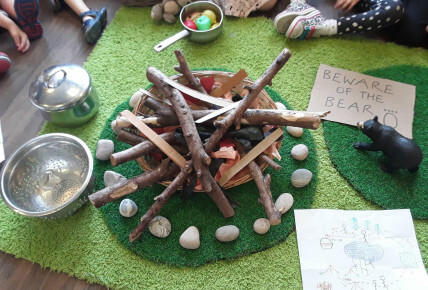 We became explorers and looked around the environment for different resources we could use to create our campfire, we found tissue paper, twigs, stones and blocks. Once we had created our campfire we all sat around it and discussed our creation. We also sang songs together and used the musical instruments and played camping games. We also designed our own maps and hid the bear in the cave we then used the map to go on a bear hunt. It was hard work and we got quite sleepy, but we woke up when the bear came. OH NO!